Until the early part of the twentieth century, Cracker Horses were quite numerous in Florida. Many of them roamed free on the open ranges, while others were used by Frontier Cattlemen and Settlers. Their serious decline started during the 1930's and when the Florida Cracker Horse Association was chartered in 1989, this breed of horses appeared to be on the edge of extinction. At that time, the State had three small herds and the rest of them, about one hundred head, were owned by a few Cattle and Ranching families who, appreciating their qualities of stamina, intelligence, quickness, durability and easy ride, continued to breed a few for their own use. These Pioneer families and their unique horses share a heritage that spans many years. Cracker Horses have never been subjected to fad or narrow purpose breeding and there is not much difference in them and the horses ridden by Conquistadors more than four hundred years ago. They are still tough, low maintenance, range bred horses who are pretty much left alone until selected for use. Though best known for their abilities as cow horses, they also do well in equine events requiring quickness and maneuverability. Although Crackers are still not plentiful, the Preservation Effort is succeeding, their numbers are increasing and the demand for them is steadily growing. There is a great amount of evidence that pre-historic horses existed in America and were once fairly numerous in Florida. For reasons unknown, these horses became extinct an estimated twelve to twenty five thousand years ago. According to scientific reasoning, prior to their extinction here, the forerunners of the Asian and European horses had made their way across the then existent land bridge connecting America and Asia that is now covered by the Bering Strait. Although no one knows exactly why or when the extinction of horses on this continent occurred, the important thing is that horses, after having evolved to the Equus we know today, did come back to America and Florida. Although the specific time when the pre-historic horses became extinct on the American continent is unknown, it is a matter of recorded history that, on his second voyage to the Caribbean in 1593, Columbus brought horses to the island of Hispanola (now known as Haiti) where they formed the basis of the first of the famed Caribbean Islands breeding herds. Historians are not very complimentary of the first horses brought to Hispanola. According to fact, or maybe legend, the Lancers in charge of the select group of horses that were to go to America did not think they would survive the voyage, so they traded them for some carthorses and pocketed the difference. Whether that is true or not, it is known that other horses brought to Hispanola and other of the islands were more representative of the horses of the Iberian Peninsula from which they came. The first horses to set foot on Florida soil since their extinction here were those brought by Ponce de Leon in 1521 on his second Florida trip. These horses, acquired from various of the islands herds, were used as mounts for the ranking members of the Ponce de Leon party, the expedition's scouts and those riders who were responsible for herding the livestock that was brought along as a food supply. Other of the Conquistadors also brought horses to Florida. Panfilo de Narvaes came here in 1528 and is said to have lost many horses. He is also credited with setting two hundred and thirteen horses ashore at the mouth of Charlotte Harbor from ships that were drawing too much water. In 1539, Hernando de Soto brought swine and many horses to Southeast Florida to sustain his search for gold. In 1540, Don Diego Maldonado brought may cattle and presumably a sufficient number of horses for herding them, to the area of what is now Santa Rosa County. Unable to rendezvous with de Soto, much of his stock was lost or abandoned. It is presumed that up until this point all of the horses landing in Florida had come from the Caribbean islands. In 1559, however, Tristan de Luna brought a great number of horses from Mexico for the purpose of founding a Colony at what is now Pensacola. His project failed and, once again, livestock was lost or abandoned. Pedro Menendez de Aviles founded the city of St. Augustine in 1565 and, along with his colonists, brought two hundred heifer calves and some horses to launch the first New World settlement. To keep American History in true perspective, a Florida Historian once wrote that by the time the Pilgrims had landed at Plymouth Rock, St. Augustine was up for urban renewal. Parochialism aside, it should be mentioned that by 1570, only ten to twelve cows and sixteen to seventeen mares were left at St. Augustine, the rest having been lost or killed by Indians. There is much speculation that the strays and escapees from the animals the Conquistadors brought to sustain their explorations and conquests, were the start of the large numbers of feral horses and cattle found in Florida when it became a United States Possession in 1821. It is certainly possible and highly probable that some of the early escapees did survive and produce. It is more likely though, that it was not until the ranching industry and the herding of horses and cattle was started during the late 1500's and early 1600's that there were sufficient escapees and strays to have served as the base for the large populations of Spanish livestock when the United States took over. After de Aviles founded St. Augustine, the Spanish Christianizers arrived, the first of whom were Jesuits. Their purpose was to convert the Indians to Christianity, educate them and teach them the European style of agriculture and the herding of livestock. They set about establishing missions and, of course, to accomplish their purposes, the missions had to be supplied with livestock and the horses to herd them. In 1573, the Jesuits were transferred to Mexico and were replaced by the Franciscans. That their mission efforts were somewhat successful is demonstrated by the fact that by the end of the 1600's there were thirty eight missions across North Florida as well as others to the North along the Atlantic seaboard. The Franciscans called their villages Doctrinos and those in Florida were scattered from St. Augustine to Apalachicola. Probably the best known of these is the San Luis Mission in the vicinity of Tallahassee. During the early 1600's, the Spaniards made a modest start of Cattle ranching in North Florida and, by the mid point of the century, cattle and horse numbers had increased significantly. As most of us know, the West got all the press about the wild Frontier, but Florida Historian Joe Ackerman has written "the first fight between Cowboys and Indians occurred in Florida during 1647." The Spanish Ranchers allowed their cattle and horses to graze wherever they pleased and those Indians who were pursuing an agrarian lifestyle took a dim view of the destruction of their crops. By the end of the 17th century, the Florida Cattle Industry was enjoying some success as there were thirty four Ranchos across North Florida. The Rancho de La Chua, in the area of what is now Alachua County, is reported to have had as many as a thousand cows and horses. There is much recorded history of the Spanish years in Florida yet to be researched. The foregoing is sufficient to provide a chronology of how the Spanish Horse became established in our State and to demonstrate that the Cracker Horse is a remnant of the horses the Spaniards brought to Florida during the years of their Conquest and occupation. The Island Breeding Farms supplied the horses needed by the Conquistadors for their explorations and conquests of the New World. Most of the horses that were brought to the Caribbean Islands for brood stock came from the Spanish Province of Cordova. These were result of a mixture, over a long period of time, of the North African Barb, the Spanish Garraro Pony, the Sorraia and other horses of the Iberian Peninsula. Some people refer to these horses as Spanish Jennets (phonetic spelling) while others call them Spanish Barbs. They ranged in size from thirteen and a half to fifteen hands and their general description was: a short back, sloping rump, low tail set, good limbs and hooves, wide forehead, beautiful eyes, delicately formed nostrils and sloping shoulders. More could be said about their physical characteristics, as the writers of that period used lengthy and glowing descriptive phrases. Based on that description, it appears that the Cracker horse of today obviously shares many of the same characteristics as those horses brought to the Caribbean Islands and, subsequently to Florida, well over four hundred years ago. In his new land, the Cracker Horse evolved over a long period of time mostly through natural selection. He was molded and tempered by a challenging environment into the horse that ultimately was to have a large part in the emergence of Florida as a cattle producing and general agriculture State. Cracker Horses got their name from the Cracker Cow Hunters who rode them and the Cracker Cow Hunters got their name from the loud cracking sound of the whips they used to herd the wily Spanish cattle. Over the years, Florida's Spanish horses have also been known by a variety of other names, depending on what area they were in, who owned them and what their principal use was. Some of them are: Florida Horse, Marsh Tacky, Woods Pony, Seminole Pony, Chickasaw Pony, Prairie Pony, Florida Cow Pony and many others. As did their ancestors, Cracker Horses range in size from thirteen and a half to fifteen hands, with short backs, sloping rumps and other of the Spanish characteristics. Their weight ranges from about seven hundred and fifty up to as much as a thousand pounds. They are known for their unusual strength, endurance, strong herding instinct, quickness and fast walking gait. Though not considered to be a gaited breed, many Crackers do have a singlefoot or running walk gait. Cracker colors are any color that is common to the horse, however, solid colors and grays are predominant in the Crackers of this day. In 1989, fearing that Cracker Horses might become extinct, Bob Barry of Newberry, Bobby Hall of San Antonio and Doug Partin of Kenansville, contacted other Florida Cattlemen who owned or shared an interest in Cracker Horses and a series of meetings were held at Kissimmee. From these meetings, the Florida Cracker Horse Association was formed and, in October of 1989, was chartered as a non-profit Florida Corporation. All of the Officers, Directors and the Executive Director-Registrar are volunteers. The FCHA registry was started in May, 1991. The first horses registered were the Foundation Horses. These were horses of known heritage and came from Cracker Family lines of longstanding. As of June 30, 2000, one hundred and thirty nine Foundation Horses plus two hundred and eighty five of their descendants had been registered. Registrations are showing reasonable increases each year and projections are that total registrations will reach seven hundred and fifty by the end of 2005. The Foundation Horses came primarily from four different Cracker Families lines that have been bred continuously for more than seventy years by different Cattle Ranching families. It was these Ranching families who kept the Cracker Horse from becoming extinct. In 1984, the late John Ayers of Brooksville donated a group of Cracker Horses to the State of Florida from which the state owned herds at the Florida Agricultural Museum in Tallahassee and the Withlacoochee State Forest were started. The Paynes Prairie State Preserve herd, where the free roaming Spanish horses were once quite numerous, was started in 1985 with Ayers line horses that were purchased and donated to the Preserve by The Friends Of Paynes Prairie, a Citizen's Support Organization. 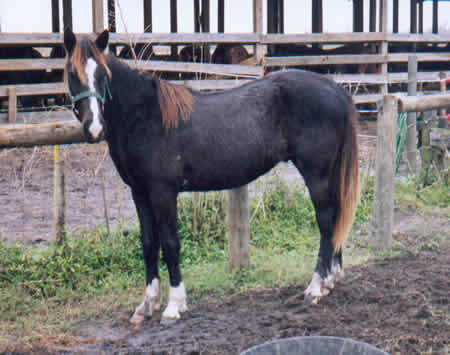 Spanish Doll, an Ayers line Florida Cracker mare owned by Sam P. Getzen of Newberry, FL. Doll is 14.1 hands, weighs 918lbs and has a singlefoot gait. 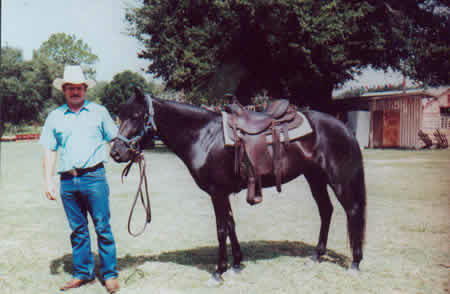 Shown in photo with horse trainer Kenny Holder. During the Frontier years and on into the mid part of this century, the Cracker Horse was used for just about anything horses were used for: pulling wagons, buggies, sleds, plows and cane mills or taking kids to school but always as Cow Ponies. Today, although still used primarily as Cow Ponies, they are finding a place in other of the activities that horses in Florida are being used for, such as Team Penning, Team Roping, Trail Riding, Endurance Riding and as mounts for historical reenactments. The Cracker Horse Preservation Effort is succeeding. Their numbers are slowly increasing, some new breeding herds have been started and the general public is becoming aware tat this unique breed of horses is indeed a living part of Florida's Frontier Heritage. Equally important is that people are learning that the Cracker is just as much a horse for the twenty first century as he was for Florida's Spanish and Frontier eras. This article and accompanying photos are courtesy of the Florida Cracker Horse Association.